From red tide to runoff to microplastics, the Indian River Lagoon faces many threats. Graduate student Casey Craig works on collecting samples from the Indian River Lagoon as part of a project to determine the level of microplastics in the lagoon. From red tide to runoff, the Indian River Lagoon faces many threats. Microplastics may be the newest identified enemy, but a team of UCF researchers and collaborators is racing to find answers before it is too late. UCF biologist Linda Walters and her team, including graduate student Casey Craig ’15, launched new research in the Indian River Lagoon this fall to determine if the record levels of microplastics found in shellfish in Mosquito Lagoon last year was an anomaly or if the problem extends to Brevard and beyond. The Mosquito Lagoon in Brevard County is the northern part of the Indian River Lagoon system along Florida’s east coast. 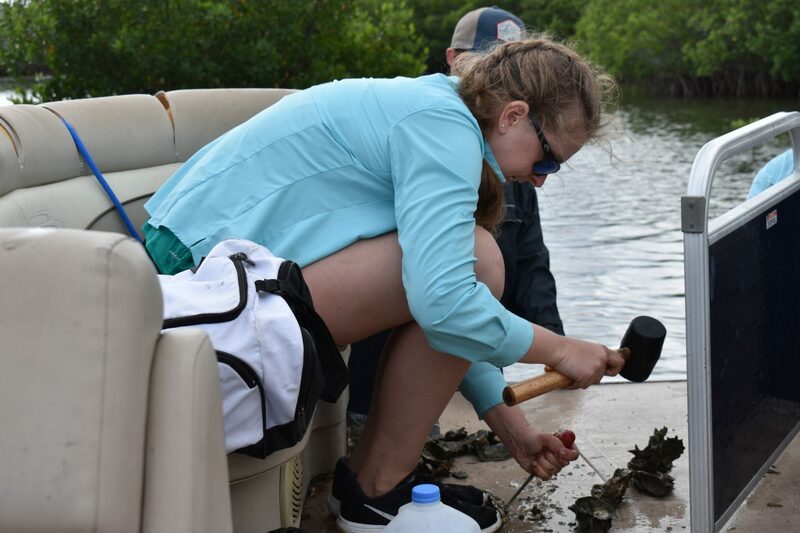 Thanks to new funding from the Indian River Lagoon National Estuary Program, Walters and her team are combing the entire 156-mile-long Indian River Lagoon taking water samples, sediment samples, and checking oyster beds for the microplastics. Microplastics are plastics smaller than 5 millimeters in length. That’s smaller than a pearl. They are pervasive globally in aquatic systems and detrimental to many estuarine species, especially filter feeders such as oysters, Walters says. Researchers have found reduced growth and survival with microplastic contamination as well as these small plastics moving up food chains as animals ingest them. Most of the microplastics found in Mosquito Lagoon were small fibers. These fibers invade the lagoon in many ways, including clothing and old, sun-bleached boat ropes that can create millions of plastic fibers as they break down. Several UCF biology students have started a grassroots effort to educate boaters about this new threat. Free posters are available describing this important issue. Collaborators on the project are the Florida Oceanographic Society, Florida DEP Aquatic Preserves Program and the Marine Discovery Center in New Smyrna Beach. All groups have citizen-scientist volunteers participating in monthly, synchronized lagoon water sampling during the next year as well as collection of oysters and sediments. The group also is collaborating with Smithsonian Institution researchers in Fort Piece to examine oyster feeding with microplastics. UCF Professor Lei Zhai is also collaborating with the team to determine the chemical identity of plastics found. Zhai is a chemist and director of the UCF NanoScience Technology Center. For more than a decade, Walters, a team of volunteers and other groups including the Brevard Zoo and the Marine Discovery Center, have worked together installing oyster beds in Mosquito Lagoon and working on shoreline-restoration projects in hopes of keeping the lagoon healthy for its critters — and the communities that rely on it for tourism dollars. Oysters filter dirty water naturally. Oyster beds have blossomed in some areas, such as Mosquito Lagoon, while struggling or dying off in others. After 12 years and more than 50,000 volunteers, Mosquito Lagoon oyster reef restoration remains a national model for community-based restoration success. “Is there a connection between the oysters and the level of microplastics? If not, what else is going on? If so, how do we mitigate? These are some of the questions we need to answer,” Walters says. Craig, a St. Petersburg, Florida native, is thrilled at the opportunity to work on the project that is dear to her heart. “As an undergraduate at UCF, I fell in love with the beauty and biodiversity of the Indian River Lagoon. I am really excited to participate in this important project with so many collaborators who equally care about the waterbody,” she says. All data collected during this project will be open access to the public, so that the citizens who helped with collections and everyone interested can see where the microplastic impact occurs lagoon-wide. This, plus an upcoming social media campaign and workshops will increase everyone’s understanding of this potentially deadly but silent lagoon crisis, Walters says.